Above: Infrared satellite image of Tropical Cyclone Sagar at 1823Z (2:23 pm EDT) Friday, May 18, 2018. At this point, Sagar was packing sustained winds at peak strength of 55 knots (65 mph). Image credit: RAMMB-CSU/NOAA. Early reports suggest widespread damage and suffering from Tropical Cyclone Sagar, which made landfall on Saturday as the strongest tropical storm ever recorded in Somalia. Packing heavy rain and top sustained winds of 60 mph, Sagar made landfall further west than any tropical cyclone in 52 years of recordkeeping for the North Indian Basin. Sagar struck at around noon local time Saturday about 100 miles southeast of the city of Djibouti, along the flat, arid coastal plain of far western Somalia. As Sagar tracked inland, satellite imagery indicated widespread rains across western Somalia, the nation of Djibouti, and far northeast Ethiopia. The disaster management authority NADFOR reported at least 16 deaths from Sagar in the Awdal region of far western Somalia, according to Abdirashed Ibrahim, director general of Somalia’s Ministry of Planning and National Development. At least 35 homes were destroyed as Sagar passed by northeast Somalia, according to reliefweb. The website also noted reports from humanitarian agencies of disruption in villages along the coastal plain of western Somalia, including 15 shelters reportedly destroyed at Ceel Sheek and a number of people missing in Bulaxaar. One woman was killed in a home fire on Friday during evacuations in Khor Maskar, Yemen, just north of Sagar’s path. Surface observations were not immediately available from Djibouti or western Somalia. According to satellite-based surface wind estimates from the Joint Typhoon Warning Center (JTWC), Sagar’s top sustained (1-minute) winds peaked at 65 mph near the end of the storm’s remarkable four-day journey across the narrow Gulf of Aden. According to insurance broker Aon Benfield, Sagar's rains in Somalia arrived on the heels of a month of unusually heavy rains. 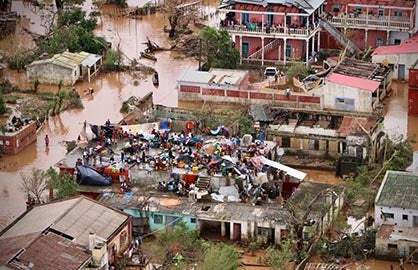 Nearly 700,000 people were affected by flooding in Somalia in April, and at least five people were killed. Among the hardest-hit regions were Gedo, Bakool, Bay, Hiraan, and Horseed, as flash flooding and overflowing rivers inundated vast areas of land. 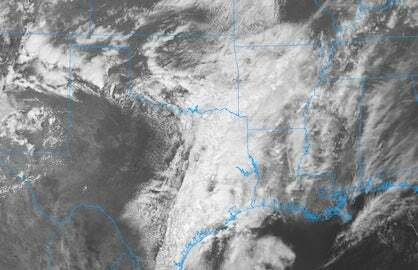 Local officials reported significant damage to agriculture and infrastructure. Only five other tropical cyclones are known to have hit Somalia since accurate satellite measurements began in 1966: Tropical Cyclone ARB02 of 2016, Tropical Cyclone ARB01 of 2013 (the nation’s deadliest cyclone on record, with at least 162 fatalities), Tropical Cyclone Murjan of 2012, Tropical Cyclone ARB02 of 1994, and Tropical Cyclone 4B of 1984. Notably, all five of these were post-monsoon (autumn) cyclones rather than springtime systems, and all of them struck the east coast of Somalia rather than its north coast. Somalia’s previous record-highest wind speed at landfall, according to Joint Typhoon Warning Center data at the International Best Track for Climate Stewardship website, was the 45 knots (55 mph) with TC ARB01 in 1994. Figure 1. 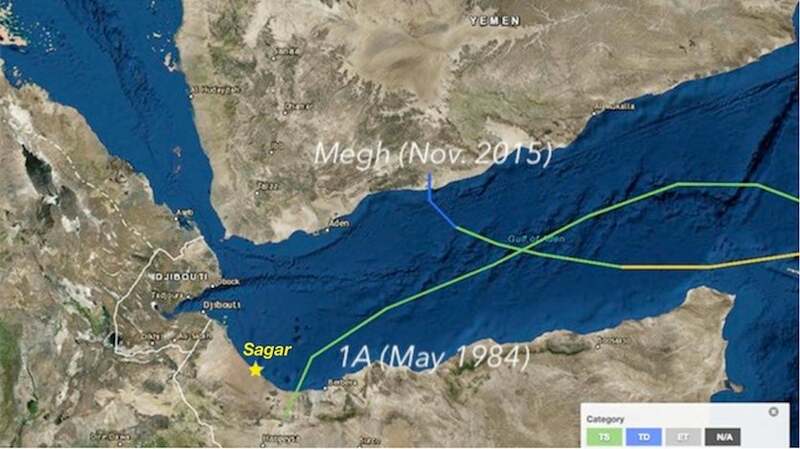 Only three tropical cyclones have tracked into the western Gulf of Aden in historical records dating to 1966. 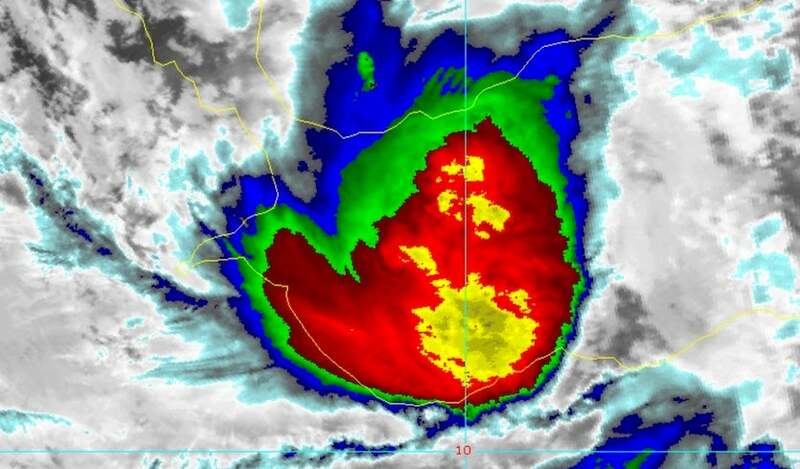 Sagar’s landfall was the westernmost of the three, and its top sustained winds at landfall were the highest. Image credit: NOAA Historical Hurricane Tracks, via weather.com. On Sunday, the HWRF and GFS forecast models indicated that a disturbance dubbed 92A could develop into an intense hurricane-strength cyclone this week, possibly threatening Oman by late in the week. The disturbance is predicted to track west before hooking sharply northward toward Oman. Sea surface temperatures of around 30°C (about 1°C above the seasonal norm) along the projected track of 92A are more than warm enough to support tropical development, and wind shear is projected to remain weak to moderate (about 10-15 knots) through at least Tuesday. Mid-level relative humidity is around 80%, which would support robust development of convection (showers and thunderstorms). The 12Z Sunday run of the HWRF develops 92A into the equivalent of a Category 4 hurricane by Thursday, weakening the cyclone to Category 2 strength at the end of the forecast period (Saturday) just a few hours from reaching Oman. The 12Z GFS brings 92A into the Oman coast as a Category 2 equivalent on Saturday. Figure 2. MODIS satellite view of Cyclone Gonu at Category 4 strength in the northwestern Arabian Sea as it approached the northeast coast of Oman at 0635Z on June 5, 2007. Image credit: NASA. 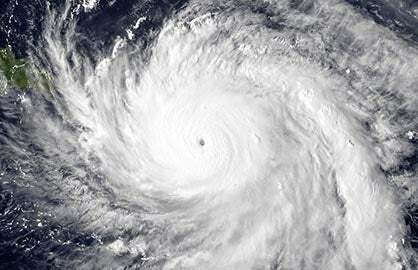 The region’s two strongest tropical cyclones on record both occurred in November 2015. 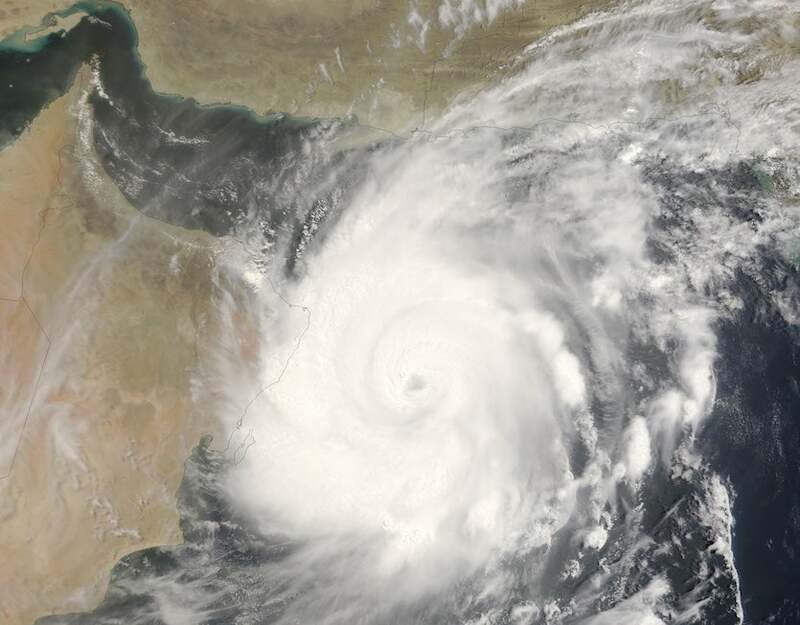 Cyclone Chapala came ashore on the south end of the Arabian Peninsula on November 4 as the first hurricane-strength cyclone ever recorded in Yemen. Just four days later, Cyclone Megh passed just north of Socotra Island east of Somalia with Category 3 winds of 110 mph, destroying hundreds of homes and killing at least 18 people. Figure 3. An outbreak of desert locusts in southwest Morocco in November 2004. Image credit: Magnus Ullman, via Wikimedia Commons. In addition to flash flooding, the Food and Agriculture Organization (FAO) of the United Nations warned that the heavy rains from Sagar could cause favorable breeding conditions for desert locusts. Plagues of these voracious locusts are a major threat to Middle East food security. 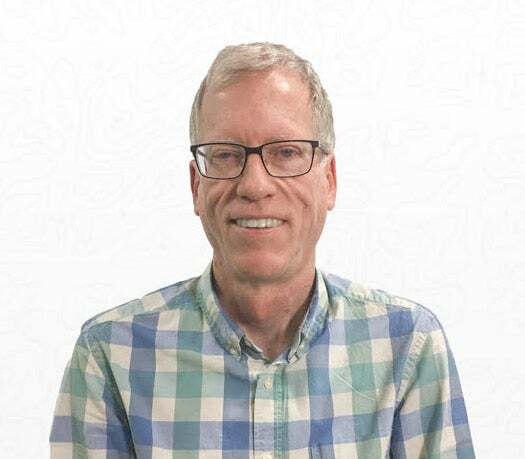 "Monitoring tropical cyclones in the Arabian Sea and Gulf of Aden is a very important part of [our forecast] strategy because historically they have been the origin or trigger of desert locust plagues," Keith Cressman, the FAO’s senior locust forecasting officer, said in an email. Cressman has been operating FAO’s early warning system for desert locust outbreaks for the past 30 years. According to the FAO, an adult desert locust can consume roughly its own weight in fresh food per day—about two grams, or 0.07 ounce. That may not sound like much, but the locusts can spawn up to five generations per year. 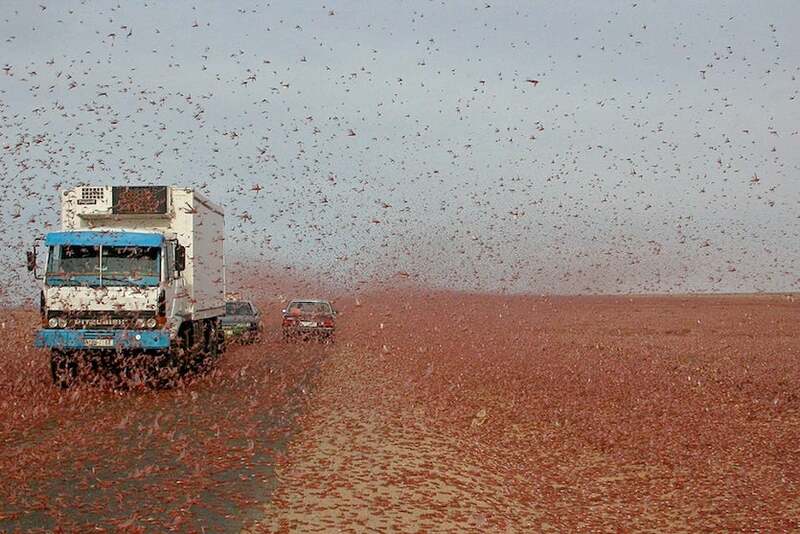 Swarms of tens of millions of locusts can travel with the wind up to 100 miles a day. Even a very small swarm eats the same amount of food in one day as about 35,000 people. Multiyear desert locust plagues tend to occur in the Middle East every couple of decades, with the most recent being in 2003-05.